On the top area of the Broken Precipice is a large pit surrounded with spikes, with some water pools and bone piles in it. 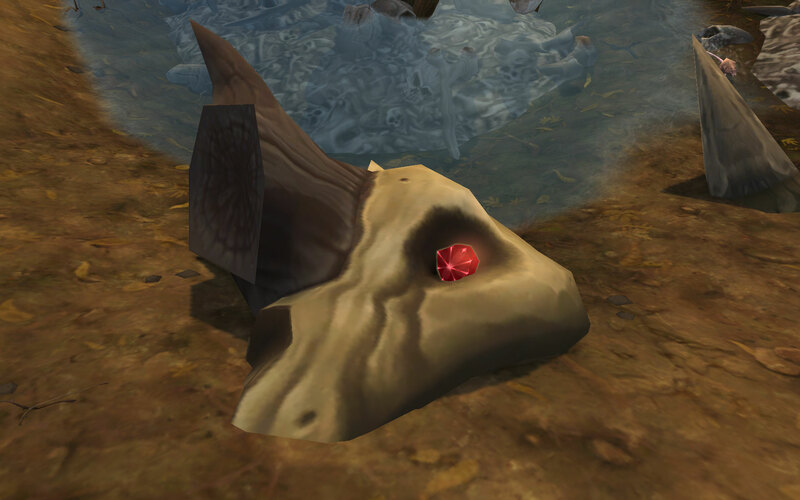 The pommel is a clickable red object on the eye socket of a large skull inside the pit. for this specific quest; see step 2 below for details. ^^ I didn't look here first, so I had to scratch my head for some time before I went up on top of one of the high pillars to get "a view from above". First then I saw and reacted on the big head in the pit with the red eye. I was to set in my head that it had to do with the head on the spike and getting the big guy to come. Fun to get some riddle to solve for a change, to get stuck. :) Normally solving the bits in a quest is like running beside a conveyor belt, everything solved as fast as you can walk, routine, boring. Above the locked massive stone door is a text engraved. It reads: " The Sum of the first 100 000 even squares." . When the answer makes you smile, you'll know it's right. Siga a pista do diário e encontre o copo do Cutelo de Gutrek. O diário revela a localização dos pedaços do cutelo de Gutrek. Ele diz: "O copo foi levado para o Precipício Alquebrado, onde encontrou abrigo na caveira da primeira vítima de Gutrek. Parece que se tratava de uma fera enorme que ele enfrentou no fosso dos ossos."